For the past 30 years, Uma Bai Netam, a Gond tribal woman, has been growing millets with her husband on 5 acres (around two hectares) of forest land in the Indian state of Chhattisgarh. Years of cultivation and habitation still did not make her the lawful owner of these 5 acres until the enactment of the Scheduled Tribes and Other Traditional Forest-Dwellers (Recognition of Forest Rights) Act, 2006 (FRA). The FRA, for the first time, sought to correct the ‘historical injustice’ against forest-dwelling communities by recognizing their customary rights to own, access, use and manage forests. FRA recognizes women as equal rights-holders to resources, by recognizing them as joint title-holders to individual plots of land, and as equal members of the core decision-making body of the Gram Sabhas (village assemblies). But if Uma Bai thought this meant she could at last live and work on her land with dignity, she was mistaken. Jointly with her husband, her Individual Forest Resource right (IFR) over 2.5 acres (around one hectare) was formally recognized after 2010 (1), but the other 2.5 acres were soon taken over by the state Forest Department to grow teak plantations. These teak plantations spread over 63 hectares of Community Forest Resources (CFR) in her and the neighbouring villages. Already struggling with impoverishment, losing half her cultivable land prevents Uma Bai from growing millets to the same extent as before. For Uma Bai, this means a hefty loss of Rs.10-11,000 annually (160 US dollars approximately). Industrial plantations to compensate forest destruction elsewhere? The teak plantation covering Uma Bai’s land is part of India’s forest offset programme called Compensatory Afforestation (CA), introduced as a measure to ‘regenerate’ forests lost to development projects in India. The state Forest Department sets up plantations in other locations to compensate for the diversion (and destruction) of forests for development projects, like mining, irrigation and infrastructure. In 2002, the ad-hoc Compensatory Afforestation Management and Planning Authority (CAMPA) was set up at the orders of the Supreme Court of India to administer CA funds collected from ‘user agencies’, or companies, in exchange of forests diverted for projects. According to the government’s own records, by 2016, an amount over Rs. 40,000 crores (around 6.2 billion US dollars) had been collected from such ‘user agencies’ (2). In 2016, the Government of India enacted the Compensatory Afforestation Fund Act (CAF Act) to institute a formal mechanism for disbursing these funds, which today stand at Rs.50,000 crores (around 7.8 billion US dollars), and counting. The CAF Act transfers this large amount of money to the rent-seeking colonial-era forest bureaucracy, completely excluding communities and the Gram Sabhas from decision-making. The centralization of India’s forest governance in the hands of the Forest Department was instrumental in the dispossession of forest-dwelling communities in the first place. While the FRA was enacted to break the stranglehold of the forest bureaucracy by vesting rights over CFR and empowering Gram Sabhas to govern forests, its promise for democratic forest governance remains under-achieved, with only 3 per cent of the potential CFR having been formally recognized in more than 10 years. In Chhattisgarh, where Uma Bai lives, no CFRs have been recognized at all. Along with government functionaries and mining lobbies, the strongest resistance to the implementation of FRA comes from the same forest bureaucracy. By re-centring the role of the forest bureaucracy in forest governance, now with access to these large amounts of funds, the CAF Act has the potential to pull the brakes on even the small gains in the recognition of forest-dwelling communities’ rights of governance under the FRA. The forest department has been forcibly taking over CFR and IFR lands for establishing compensatory tree plantations. According to a study carried out by CFR-Learning & Advocacy (3), a forest rights group, in the forest-rich states of Odisha, Jharkhand, Maharashtra and Chhattisgarh, CA plantations have routinely been set up on community commons, cultivable land, and sites of cultural significance. Community lands have been fenced off, sometimes with wire-fencing and others with armed guards, to prevent people’s access to resources. For women, who have a closer relationship and dependence on the land and forests, this has created an environment of fear and harassment. 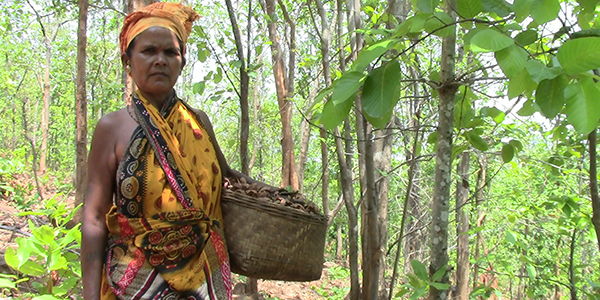 Responsible for meeting their own and the household’s livelihood and income needs through the collection of minor forest produce, women now encounter grave hardship in meeting these daily needs for nutrition, fuel, non-timber forest products, medicinal herbs and income. In several areas, the Forest Department has cleared dense natural forests to replace them with monoculture commercial plantations. The CFR Learning & Advocacy study found that out of 2,548 CA plantations undertaken in 10 states, 60 per cent were monoculture and of commercial species, with teak and eucalyptus together comprising more than 25 per cent of the trees planted. This has wrecked havoc for local communities and the natural diversity of plant and animal species in forests. For example, teak plantations have completely destroyed the habitats of the Kutia Kondhs, a Particularly Vulnerable Tribal Group (PVTG) living in the eastern Indian state of Odisha, and has brought their food basket of almost 80 different types of millets down to 25. The ultimate displacement, and complete deprivation from forest access and use has caused distress migration within the community for the first time ever. The ensuing change in their cultural fabric and way of life is irreversible. Across different villages, women remain defiant at the continuing efforts of land-grab and harassment as a result of these plantations, and are resisting through legal and political means. In pockets of Jharkhand and Odisha, plantations have become a rallying point for the formation of mandatory Forest Rights Committees by the Gram Sabhas, often at the initiative of women. In Chhattisgarh and Jharkhand, communities have organized into groups to spread awareness about their Community Forest Resources rights. They have protested, forcefully stopped these plantations and complained to government officials. Opposition to these forcible and destructive plantations have been countered by the Forest Department with violence against men and women, as with the Kutia Kondhs, and by lodging forest offence cases against tribals and PVTGs. As the lives and livelihoods of forest-dwelling women change in such drastic ways on account of CA plantations, their insecurity of tenure often prevents them from having a voice in decision-making processes. Their claims for Community Forest Resources, Individual Forest Resource and Community Resources recognized by the FRA are rejected by government authorities, kept pending year after year, or their exercise denied. The Forest Department has not approached the Gram Sabhas to seek their consent before setting up these plantations. Sometimes the consent has been procured coercively through violence and harassment. Communities already losing forests to development projects are hit hard a second time when their land is taken for compensatory commercial plantations. In this scenario, the spaces for women to assert their rights for participation in decision-making are undercut by institutional as well as cultural factors. By all accounts, CA plantations are neither good for the environment nor for the people. Forests, once ravaged, cannot be ‘replanted’. Evidence from numerous instances across the globe bear testimony to the fact that it is only with secure tenure for communities, particularly the women within them, that forests can be conserved and protected. As the primary users of forests, holders and think-tank of traditional-knowledge, women are the core and backbone in the process of resource conservation. In India there are thousands of forest protection groups, led and managed predominantly by women, who have successfully increased forest cover, regenerated streams, rebuilt destroyed wildlife habitats, and curbed illegal poaching and smuggling. Yet, their role in forest conservation and restoration is hardly ever acknowledged in official discourse on forest protection and restoration. The message is clear: forest conservation and regeneration requires not monoculture commercial plantations controlled by the Forest Department, but the stewardship of communities, with women taking centre stage in the process. By securing women’s rights to forests, the FRA provides a roadmap for bringing women’s knowledge, experience and authority in forest governance to the forefront. This requires active interventions to overcome policy-level, institutional and cultural barriers that marginalize women’s participation in decision-making. (1) The FRA broadly identifies three kinds of resource rights: Community Forest Resource rights (CFR), vesting the rights of governance and ownership over the customary forest boundaries in the Gram Sabha (village assembly); Individual Forest Resource rights (IFR) covers land occupied, inhabited or cultivated by a household; and Community Resource rights (CR) over minor forest produce, grazing lands, intellectual property etc.